It’s been quite a few weeks for airport security, following the failed Christmas Day attack and several subsequent breaches and mishaps. But now that the dust has settled and airport security procedures have stabilized—for the foreseeable future, at least—it’s time to review all the new rules and refresh the basics every traveler should know before heading to the airport. And if something changes, fear not: we will update this document as new rules emerge and old ones are amended. The contradiction in this paragraph is at the heart of travelers’ questions about airport security. Requirements “remain the same,” but passengers may notice “additional security measures.” What does this mean in practical terms? Basically, travelers can bring the same things they could before the Christmas bombing attack, but their bags, particularly carry-ons, will receive much more scrutiny. In a recent New York Times article, Michelle Higgins outlines several clever ways to minimize the extra attention our luggage will inevitably receive. Tips include placing any potentially suspicious-looking items, such as a bar of soap (yes, a bar of soap), near the top of your bag, or using special laptop bags which permit unobstructed X-rays of the laptop. It’s also important as ever to know the rules, especially when it comes to liquids. Of course, “additional security measures” don’t merely include bag searches and pat downs. Shortly after the Christmas attack, the Department of Homeland Security ordered 300 whole-body imaging scanners to be deployed throughout the country in 2010. And the president’s proposed budget for 2011 requests $734 million to fund the deployment of 1,000 more scanners. Bottom line: Get ready to be scanned. The effectiveness of these scanners is far from certain, and though they have been largely accepted by the public as a necessary aspect of airport security, serious privacy issues remain. One of the TSA’s most controversial moves following the Christmas attack was to identify 14 nations it considers “state sponsors of terrorism” or simply “countries of interest,” and subject travelers from or passing through those countries to enhanced screening. The fourteen nations are Afghanistan, Algeria, Cuba, Lebanon, Libya, Iran, Iraq, Nigeria, Pakistan, Saudi Arabia, Somalia, Sudan, Syria, and Yemen. Fortunately, American citizens, even those traveling through one of the countries, should not automatically face this enhanced screening, which can include full-body pat downs, thorough bag searches, and body scanners. But any traveler exhibiting certain behavior or whose baggage appears to contain suspicious items can be selected for additional screening. In early January, carry-ons were banned for travel from the U.S. to Canada, causing more than a bit of concern, especially with the Olympics on the horizon. But few weeks later, the rules were eased, allowing passengers to bring one carry-on bag, though not without a long list of rules and exceptions. For some unknown yet supposedly security-related reason, American Airlines is only allowing one carry-on for some flights from Europe, as opposed to the traditional allowance of one carry-on and one personal item. 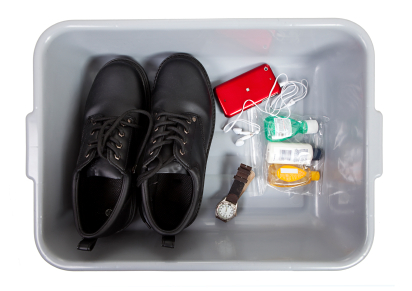 Frequent fliers and first- or business-class travelers can still bring that additional personal item. The destinations affected are Barcelona, Brussels, Dublin, Frankfurt, London, Madrid, Manchester, Milan, Paris, Rome, and Zurich. American says the restrictions will be in place “until further notice,” so travelers should check the airline website before flying to any of the listed destinations. Secure Flight is the TSA’s new program of collecting passengers’ birthdates and gender, in addition to names, during the booking process. The TSA claims this allows for more accurate matching of names on the no-fly and watchlists, and should cut down on the instances of misidentification that have plagued the process for years. Since August, the TSA has been phasing in this program airline by airline. American was among the first airlines to begin collecting this additional data, and domestic implementation is expected to be complete early this year, with international implementation not too far behind. Citizens must apply to the program and pay a $100 non-refundable fee, and there’s no guarantee that all applicants will be accepted. But for frequent international travelers, the benefit of skipping long lines at customs may be well worth the hassle and expense. The catch to all of this is that while circumstances certainly have “settled,” the airport security measures outlined here could change at any time, especially if there’s an incident. Travelers should pay close attention to the news, and double-check the rules and restrictions for specific destinations and airlines before traveling. And again, we will be updating this document as new information comes out. Readers, do you have any personal experience with these new security measures? Have you passed through a whole-body scanner, or flown through one of the 14 nations where extra security measures are in place?